SAN FRANCISCO, CA (January 23, 2019) — The city of San Francisco is constantly changing and evolving, from its genesis as the country’s leading gold rush destination to its current status as the technology and information center of the world. Yet as the city increasingly becomes a hub for global capital, access to city services, infrastructure and housing has drastically diminished for many people. Notions of civic participation and inclusion in San Francisco have also undergone profound changes, prompting questions around how to make and protect space for living. Take Part, a commission by the artist team Bik Van der Pol, and part of the Public Knowledge partnership between the San Francisco Museum of Modern Art (SFMOMA) and the San Francisco Public Library (SFPL), seeks to create a shared public vision of the city by anchoring discussions about its past, present and future, as well as its challenges and opportunities, to a tangible object — a thousand-square-foot scale model of the city of San Francisco built in the late 1930s. Sections of the model will be displayed at the 27 branches of the SFPL, the Main Library and at SFMOMA’s Public Knowledge Library at the museum. “The model aims to create a theatrical platform where people gather with their questions and concerns; not to oppress but to empower, to collectively become something bigger, eventually. To leverage ‘publicness’ to more publicness,” explained artists Liesbeth Bik and Jos van der Pol. Each branch will display the section of the model representing its neighborhood and collectively present over 100 programs for all ages offering new insight, discussion and creativity over the course of two months beginning January 25 through March 25, 2019. Artists Bik Van der Pol learned about the model during a research trip to San Francisco, then began to explore using it as a basis for a larger project about civic imagination. This project is consistent with their global approach to understand social relationships, bring light to hidden stories and resources and make those stories more public. The model, a detailed wooden replica of the city of San Francisco at a scale of one inch to one hundred feet, was built by the Works Progress Administration (WPA) in the late 1930s as part of the New Deal. A passion project of noted San Francisco architect Timothy Pflueger, the model took two years to build and was created as a city planning tool, a tourist attraction and for education purposes. Fully assembled, it is 41 x 37 feet with a total area of more than one thousand square feet. The model has not been on public view in its entirety since 1942. Each city “block” was created for the model as a literal wooden block that can be lifted out, allowing for hands-on interaction with the city, and making the model easy to update as the city changed. The model is one of several city scale models made in the U.S., the most famous of which is the Panorama of the City of New York made for the 1964 World’s Fair, and now part of the collection and on display at the Queens Museum. In 1939, the model was first displayed in partial sections in the Golden Gate International Exposition on Treasure Island. It was one of many WPA projects in the Bay Area at that time, including the Golden Gate Bridge, the San Francisco Airport, the Caldecott Tunnel, the San Francisco Zoo and Treasure Island. In 1942, after its display at the Golden Gate International Exposition and at San Francisco City Hall, the model was packed away. In the 1960s, the model was moved to the University of California, Berkeley, where the downtown portion was used as an urban planning tool by the Environmental Simulation Laboratory to study how that neighborhood could be developed without sacrificing the character of the city. 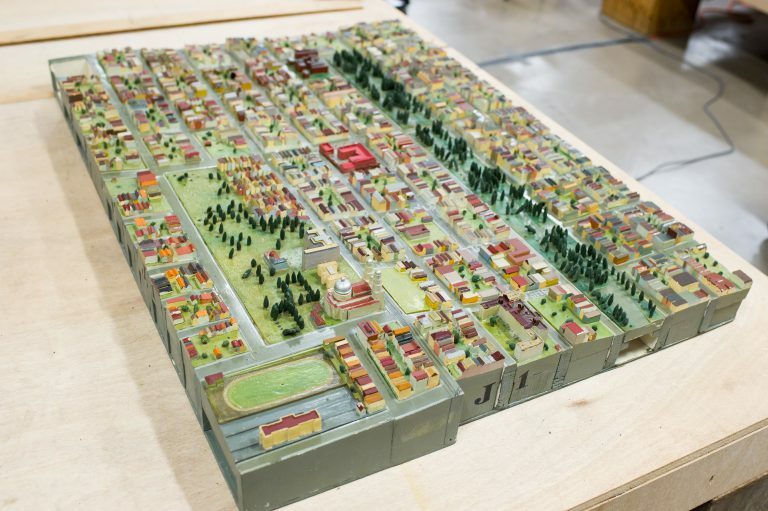 The rest of the model, comprising roughly two-thirds of the city (primarily the western and southern neighborhoods) was placed in storage, where it remained until SFMOMA approached UC Berkeley about this project. A partnership between SFMOMA, SFPL, UC Berkeley faculty and artists Bik Van der Pol initiated the largest public display of 70 pieces of the model in over 75 years. During the summer of 2018, the 6,000 blocks of the model were cleaned and assessed neighborhood by neighborhood by a team of SFMOMA staff and volunteers. A series of meetings between librarians and community stakeholders generated a plan to utilize the model for civic engagement by displaying it in all the branches of the SFPL. Each neighborhood will be on display in its corresponding library, including the 27 neighborhood branches, the Main Library and the Public Knowledge Library at SFMOMA, located in the Koret Education Center in the museum’s free space. Click here to see cartographer David Rumsey’s digital composite of the model and its neighborhoods. 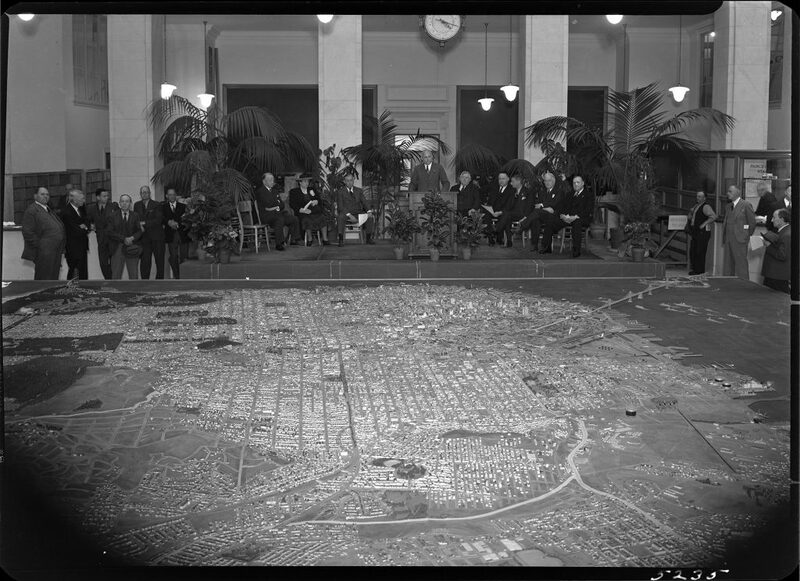 Over 100 events and programs relating to the model and San Francisco have been developed according to each neighborhood’s interests. They focus on key themes broadly relating to civic participation. Model sections will be used by participants to learn about the city’s hidden past and stimulate discussions about the city’s neighborhoods. Activities for a range of ages will include site-specific storytelling, town hall discussions, history nights, virtual tours, neighborhood walks, bike rides, mapmaking and more. Click here for a complete link to all Take Part programming. Public Knowledge: Take Part was inspired by “Taking Part,” a community-planning workshop process created in the 1970s by Lawrence and Anna Halprin, a noted landscape architect and dancer/choreographer, respectively. The workshops encouraged “collective creativity,” or people working together in groups to solve complex problems. Collective creativity can be applied to a range of interactions, including personal communications, city planning, education and community development. Take Part encourages collective creativity by sharing ideas and soliciting advice and knowledge from across layers of society. The project involves a multitude of voices in discussions, and invites participants from diverse backgrounds, skills and ages to infuse the model with their perspectives. Bik Van der Pol is the collective name of the Dutch artist duo Liesbeth Bik and Jos Van der Pol, whose vision guides Take Part. Through a variety of forms including performance, publications, videos and projects, the artists explore how ideas and culture are made public and the conditions under which that takes place. Over the past 20 years, the artists have realized dozens of projects around the world examining a range of issues including air rights regulations in New York City (As Above So Below, 2011), participatory democracy in Porto Alegre, Brazil (What If the Moon Were Just a Jump Away?, 2013) and memorials to the 1980 uprising in Gwangju, Korea (How Does a Straight Line Feel?, 2016). 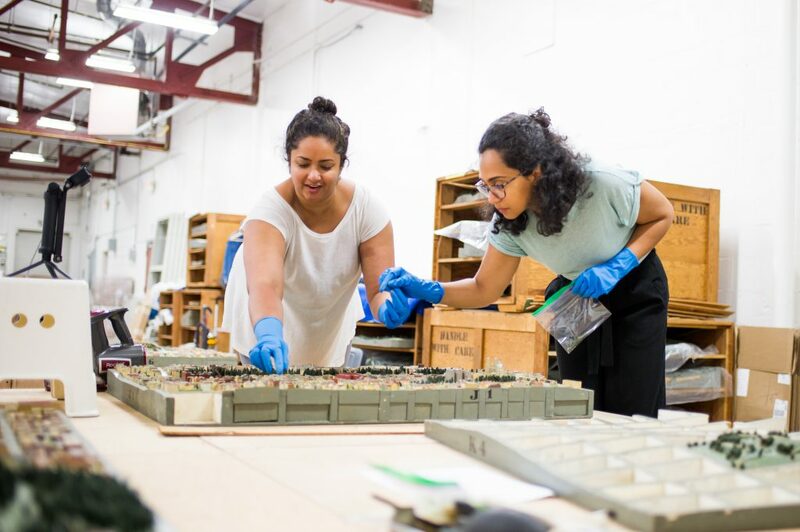 Their projects have involved archives and collections as well as local histories and they typically facilitate dialogue among residents or participants. Through these conversations, the artists identify stories or relationships and make them visible. In Take Part, Bik Van der Pol aims to articulate how art can produce a public sphere and create space for speculation and imagination in and about San Francisco. The work here explores questions about public rights to space, changing communities and how we make decisions as a city. Public Knowledge is a collaboration between SFMOMA and the San Francisco Public Library that focuses on the changing city and knowledge in the digital age. It has four main components: a temporary branch of the SFPL inside SFMOMA with resources focusing on art, activism, technology, cities, culture and education; a series of public talks; artist commissions; and online publishing. Funded by a generous grant from the National Endowment for the Humanities, the program was co-curated by former SFMOMA curators Deena Chalabi and Dominic Willsdon. Tomoko Kanamitsu, interim head of Public Dialogue, serves as project director and the project manager is Stella Lochman, senior program associate of Public Dialogue.